It is in the town’s best interests, both economically and environmentally, to nurture Royal Leamington Spa as an attractive and safe place to visit, live and work. Hanging baskets are an important part of making the town centre look attractive during the summer months and are always met with a positive response from both shoppers and retailers. 250 baskets have been ordered which will be displayed within the BID area from June through to October. BID Leamington is currently responsible for purchasing the hanging baskets within the BID area but prior to this, businesses were responsible for buying their own baskets which were supplied by Warwick District Council at the cost of approximately £120 each. (Please note that, when filled, the baskets weigh over 80lbs and have to be hung on a WDC installed bracket. Unfortunately not all shop fascias are able to support this weight and so we are not able to guarantee that every request will be fulfilled). With the increase in online sales, towns face major competition to maintain Christmas trade in their centres. Making Royal Leamington Spa an attractive place to shop during Christmas, and creating a positive and interesting shopping experience is key to improving the town’s footfall. In a good example of local agencies working together for the benefit of Royal Leamington Spa, the Christmas lights are sourced and organised jointly between the BID and Warwick District Council (WDC). The lights are funded by BID Leamington whilst the Christmas Lights Switch-On is organised by WDC. The installation, removal and storage of all the lights, together with the scheme outside the BID area, are funded by Warwick District Council, Leamington Town Council, and Sketts. *Remember that the last high-street shopping days before Christmas may be a Sunday or Monday – that’s after Internet ordering deadlines – so it’s your time to shine! 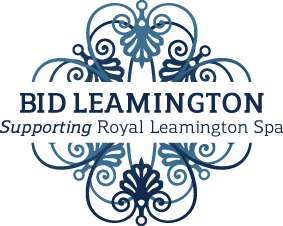 BID Leamington recognises that modern way-finding is a science that can control how people move around Royal Leamington Spa. If executed poorly, a way-finding system can diminish areas of a town while other locations flourish. Commissioning a professional study on how Royal Leamington Spa can benefit as a whole from improved way-finding, and help to influence visitor behaviour. Commissioning an attractive 3D map that is extensively used in BID marketing and promotional materials. Implementing street identification improvements through providing 35 new nameplates in the town centre. Covering the fronts of long-term vacant units with vinyls, including a map and business directory. Providing 3 free-standing A0 maps and associated business directory at key locations in the town centre as a stop-gap measure while fixed signage is being negotiated. Recent developments have seen significant progress in our desire to deliver improved physical way-finding signage in the town centre. BID is now consulting with planning advisors to ensure that any signage is sympathetic to the town’s distinctive architectural style, while meeting modern requirements. In principle, we have agreement to deliver improved signage in car parks and on main thoroughfares. Work is now being done to agree the details of fixed signage at key locations in town. Familiarise yourself with the layout of the town, carparks and stores so you can give customers helpful advice – customers will always return to, and tell their friends about, a friendly and helpful store!